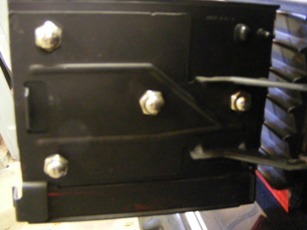 Your 1979 1980 1981 Trans Am or Firebird’s tail lights are easy to get right! We offer a wide variety of used GM and new replacement parts. 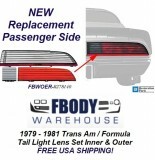 In addition Fbodywarehouse offers a complete restoration service for your tail lights. 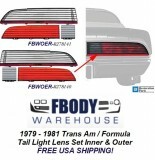 So if you simply need the correct replacement bulbs or a complete restoration with an LED upgrade Fbodywarehouse can help! 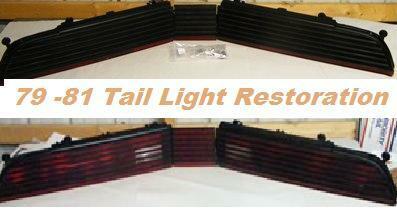 1979 - 1981 Trans Am Tail Lights Fuel Door NEW w or w/o Bird! 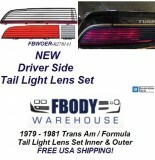 1979 1980 1981 Trans Am / Firebird Formula Tail Light Lens Set Driver Side NEW GM Authorized Reproduction! 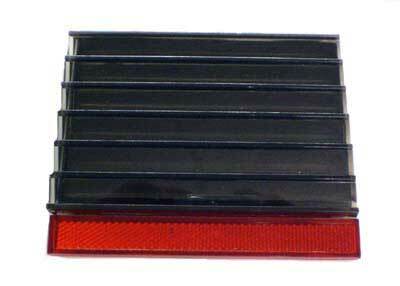 1979 1980 1981 Trans Am / Firebird Formula Tail Light Lens Set NEW GM Authorized Reproduction!